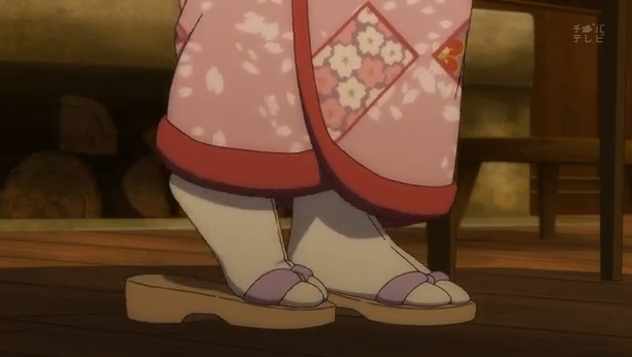 These are Yune's indoor sandals. Her outdoor sandals are much taller, and make a pronounced clopping sound. Episode 2 of Ikoku Meiro no Croisée (Crossroads to the foriegn labyrinth) shows Yune trying to adjust to her new surroundings, including a walk around the neighborhood, and the odd things that people eat in foreign lands. This episode gets right into it by discussing different breakfast customs. 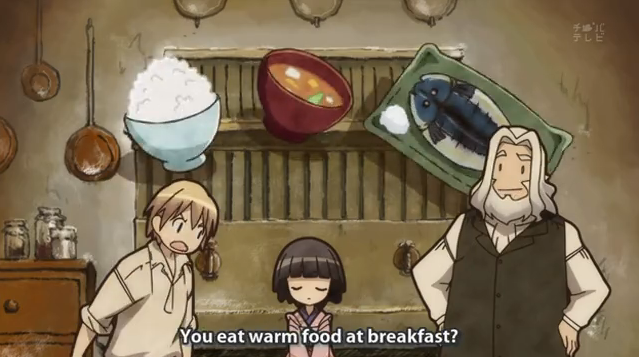 Yune is surprised (and a bit disappointed) to find how those crazy French guys eat. They don’t have miso soup for breakfast, they don’t even say “thanks for the meal” before digging in. Worse, they drink coffee and eat cheese. Through it all, Yune shows a resolve to eat the foods Oscar and Claude put before her, something that Claude can’t understand. This time we get to see Claude's forge in action. I mentioned in last episode’s post, that Claude’s work room had a table on which it appeared he burnt things to heat his iron. 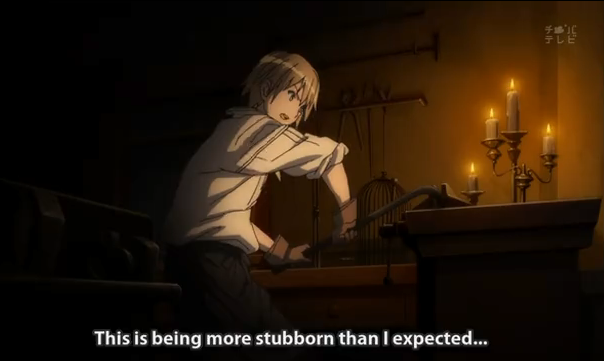 This time we get to see him working it with bellows, and hammering heated metal. In the screenshot above one can also see that there are ventilation ducts to allow the smoke to escape. I guess we couldn’t see them previously because, without the fire burning, that room was pretty dark. 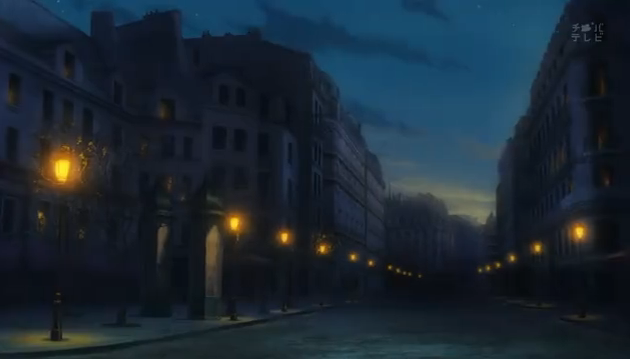 Speaking of dark: the gaslights of Paris and the dawning sky. We saw this bench clamp in the first episode as well. 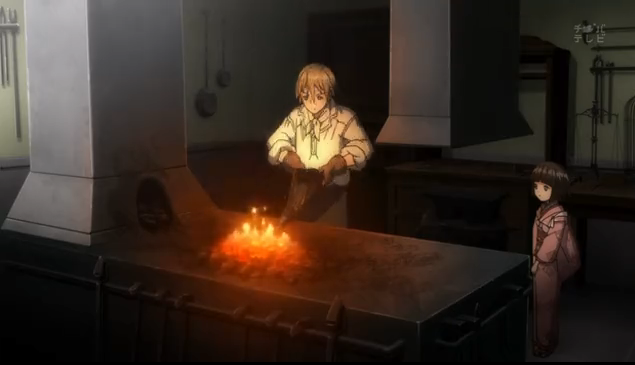 Notice that Claude is working by candle light. One interesting aspect of this show is that they have been emphasizing the lack of light available at the time. Most indoor scenes are quite dark, and candles are scattered all about. People have to make the most of the sun. The natural light sources give everything but the mid-day scenes a very warm glow, despite the surrounding darkness. Claude does not think highly of the Blanche family. They run this large department store. 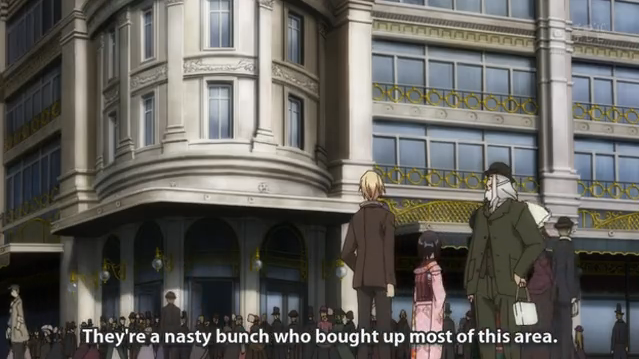 When Claude and Yune go out shopping, we get more than a tour of the Parisian streets. Apparently the small shops in the Galerie are suffering because the Blanche family has opened a Walmart large department store that has inexpensive goods of all kinds. Also troubling, Yune’s mother’s kimono was purchased by the Blanche family, so, if Claude is to get it back for her, it is going to be a real pain. And we find out that Oscar has a habit of trying to pick up women. 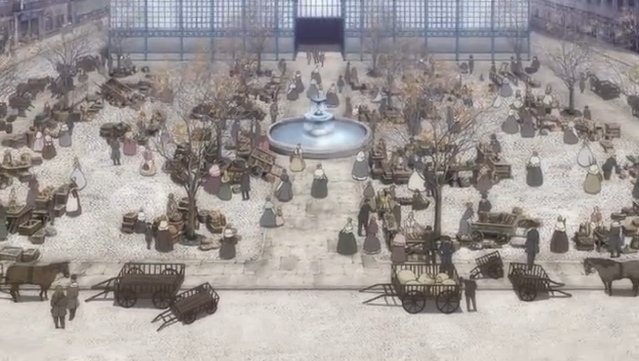 Yune enjoyed exploring the open-air market. 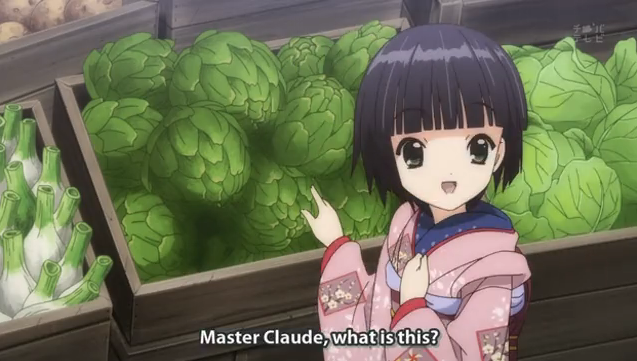 Yune shows her eagerness to learn the foods and customs of France. She also seems very concerned about how much things cost (probably she is worried that she is being a burden). We get a quick glimpse of a boy fishing in what looks like a trash barrel. I think he was looking in the store window when Yune accidentally broke the sign. I bet we’ll see him again. Later Claude is pretty thoughtful in giving Yune a job to do (peeling vegetables for dinner) and showing her where the bakery is the next morning, so that she can gradually feel like she is contributing something to her adopted household. 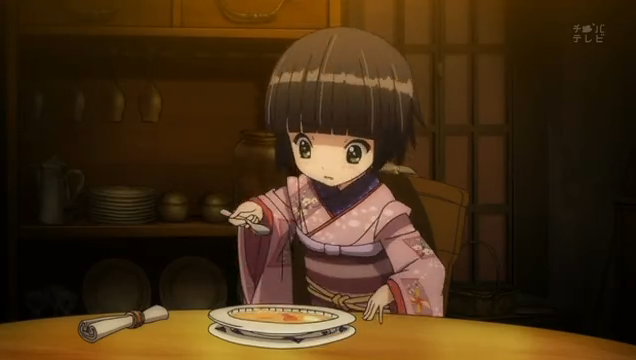 Yune struggling to learn how to use a spoon. Yune is still not used to French customs, but she is trying, and both Oscar and Claude are showing a willingness both to accept her as she is, and to help her by finding little ways to smooth over some of the bumps. Like I said in the first episode post: I think this is going to be a “healing” style anime, not one with a lot of dramatic conflict, but rather showing how people can open up their hearts and learn to live with each other. Part of me sees Croisee as like a basic primer on Japanese customs… Nice observation about the lack of light. I hadn’t noticed that. Yes. it is definitely playing out that way so far. Although they also are showing some aspects of Western culture, in the department store for example. 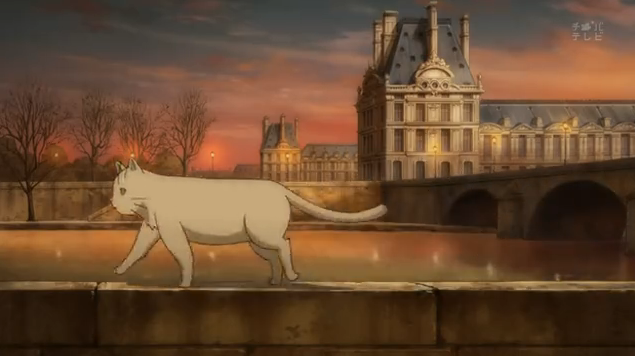 I like the show so far, and think the way they are showing the interaction with the natural world (even in the big city of Paris) will be interest to watch. Oscar mentioned that the days will be getting shorter, so I think we’ll be seeing some Winter-themed episodes coming up. Yay to culture difference on dining, cuisine, shopping, and other food related stuff xD There hasn’t been this much in the manga. Interesting, I remember you said they tweaked the first episode to make Yune’s knowledge of French more believable, so I guess they are doing a good job in adaption. If you haven’t seen it yet, you better prepae yourself. Somehow it’s even cuter than the first episode. Only the parts when they bough bread and when they ate dinner were in the manga, the rest is anime original. 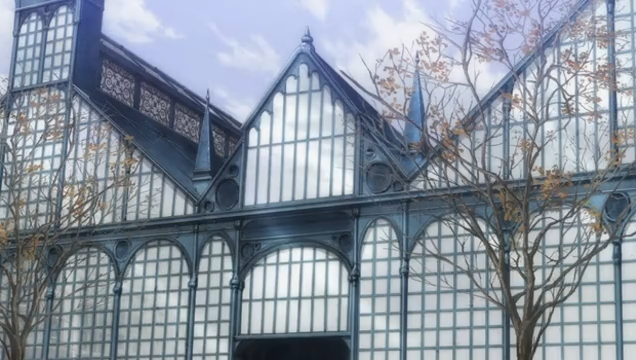 It even had some foreshadowing (the department store will be quite important later). And I thought I’m the only one who noticed the lack of lights on this show. Morning was rather dark for them and they even need candles for breakfast. Are there no windows available for that era? Other than that, I like how the show portrays the cultural differences and I admire Yune’s willingness to learn. There were windows, but, in a city, you often only get the light that is reflected off of other buildings. There is, of course, no electricity so only candles and lamps for artificial light. Finally windows often had to be small, since they would be a major liability in Winter (remember there was no central heating).